The world-leading software developer dedicated to providing iTunes DRM removal software for macOS and Windows. All you need to break the limits of iTunes DRM protection. You purchased Apple Music or iTunes Movie, but can’t play them on your smartphone or car stereo? In this article we will introduce some software which is the perfect solution to DRM protection issues. iTunes store offers millions of music, movies and audiobooks that people can purchase. But the problem is, these purchased media files can only be played on your authorized devices. In other words, like MP3 files it can neither be moved to other devices nor can be shared with your friends and colleagues. This is because movies or music purchased from iTunes store are DRM encrypted. Not only iTunes store, now many online stores also offer DRM protection files such as the Audible files bought from Amazon. To get over this issue, you need to use DRM Removal software. Being focused on the legal solution to DRM protection problem and continuous product updates, AppleMacSoft is the first iTunes DRM Removal software provider since 2006. 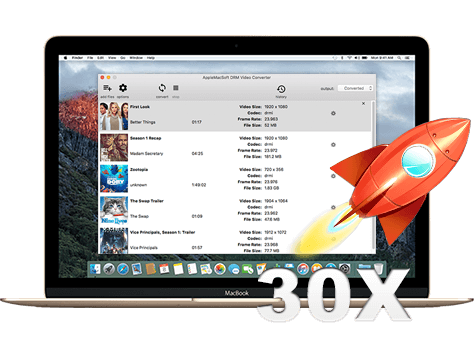 With the experience achieved from last 10 years, now AppleMacSoft offers the perfect solutions for iTunes movies, Apple music and Audiobooks. We are about to briefly introduce several DRM Removal Software brought to you by AppleMacSoft. You can quickly compare and choose the right software for you which is going to save both time and effort. Legally removes the iTunes's DRM protection and converts Apple Music or other iTunes audio into MP3, AAC, M4A, MKA etc. audio formats. Supports conversion of any playable iTunes audio including protected and unprotected files. It can also convert Audible audiobooks into MP3 format. Automatically synchronizes iTunes playlists. Moreover, supports custom output file name. It runs on Mac and supports the latest version of iTunes. All-in-one Apple Music, M4P and Audiobook Converter. It also works with all unprotected audio formats. Supports 9 audio output formats. Perfectly supports macOS Mojave and iTunes 12.9.4.94. It does not support convert iTunes movies to videos. Only woks on Mac OS X. Compared to DRM Converter for Mac, functionality of DRM Video Converter is relatively simple. The main purpose of this software is to remove DRM protection from iTunes movies and TV shows. But the best thing about this software is, while removing DRM protection, it can convert purchased or rented iTunes movies into MP4 format without quality loss. Even the converted MP4 file perfectly keeps original multilingual subtitles, Dolby 5.1 and so on. The software interface is simple and pretty easy to use. If you often buy or rent movies from iTunes store, and if you want to watch iTunes DRM protected movies on your smartphone, smart TV or other devices without any trouble. DRM Video Converter for Mac is an ideal choice. 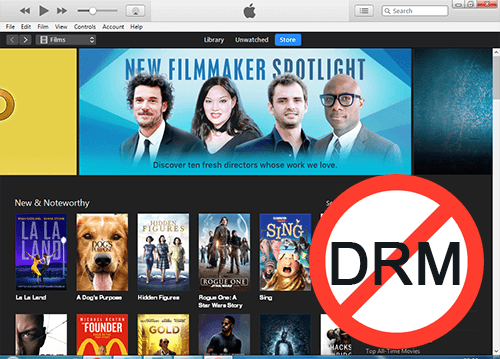 Remove DRM from both iTunes purchases and rentals with ease. Perfectly keep AC3 Dolby 5.1 audio track, subtitles while converting M4V movies. It does NOT supports macOS 10.13 High Sierra and 10.14 Mojave. Only output to MP4 video formats. Only DRM protected videos (M4V) can be loaded into program. Specialized in lossless conversion of M4V to MP4 format on Windows. It is superior to other software for the advantages like easy-to-use interface, 1:1 lossless copy, fastest converting speed and Retain multi-language subtitles and 5.1 auido track. After the conversion, you can transfer and play iTunes movies to any mobile devices that you like. If you used to purchase or rent movies and TV shows from iTunes Store, and you are using Windows OS, then using Easy M4V Converter for Windows is truly a right decision. Now available for Windows 7, Windows 8 as well as Windows 10. 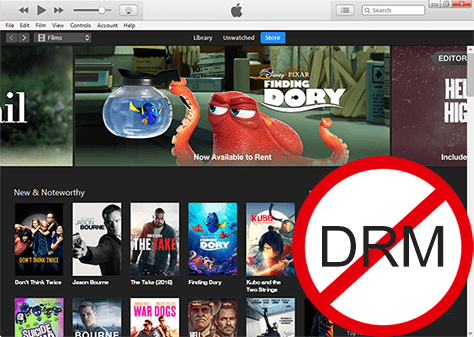 Legally remove DRM protection from iTunes movies or TV-shows. Lossless conversion of M4V to MP4 without quality loss. Easily upload movies/TV shows directly from the iTunes library. Supports the latest version of iTunes 12.9.3.4 and Windows 10. Only iTunes M4V videos can be loaded into program. 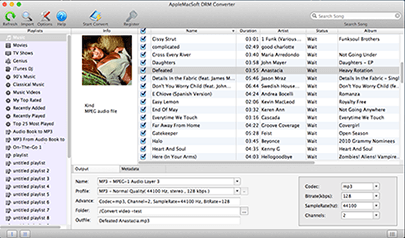 Easy DRM Converter enables you to easily remove DRM protection from Apple Music, Audiobooks and get the DRM-free MP3 for playback on all popular devices. Easy DRM Converter runs on Windows operating system. Its functions and features are exactly same as DRM Converter for Mac. 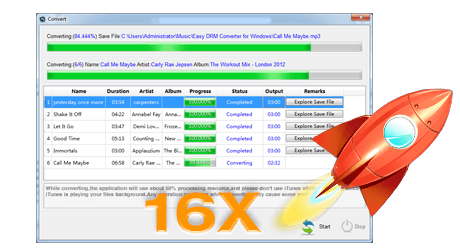 Easily convert DRM protected and any non-protected music to MP3. Perfectly supports Windows 10 and iTunes 12.9.4. Unable to convert itunes movies to MP4. It is an audiobook DRM removal software that allows you to remove DRM protection from iTunes audiobooks as well as from Audible audiobooks. 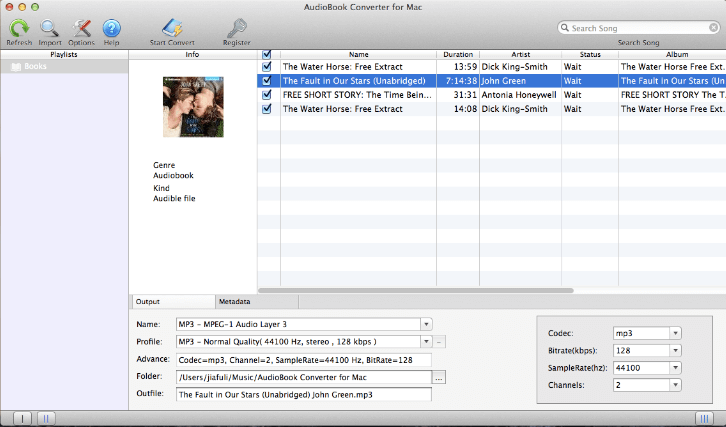 Supports batch conversion of iTunes audiobooks (M4B), Audible (AA and AAX) files into unprotected MP3 format. Converted audio files will keep the original chapters, ID3 tags and so on. Using this software, can share and listen your purchased audiobooks on other media devices without any limitation. Easily remove DRM from iTunes M4B and Audible AA, AAX audiobooks. Keep all metadata info and chapters in converted audiobooks. Work at 16x faster speed. Require iTunes 10 or later. It does not support iTunes music and iTunes videos.